And the voices of the day murmur low and sink to rest. 'Tis an echo from the walls of our own, our fair Cornell. 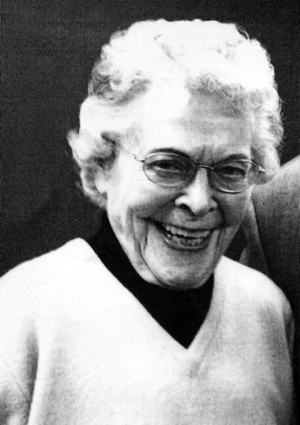 COOPERSTOWN - Mary R. Wright, who lit many new trails for women during her sixty years in hospitality as one of the first women hired to manage a hotel, chair a collegiate hospitality program, and start her own consulting practice, died on November 8, 2017, at her home in Cooperstown. She was 93. Born July 1, 1924, in Syracuse, she was the only child of Roy Lafayette Wright, who was born in Siloam, and Syracuse-born Laura M. Newman Wright Barnard. Raised in Herkimer, Miss Wright was introduced to Otsego County as a junior in high school when her father arranged a summer job for her as a carhop at Ye Olde Dutch Mill in Emmons. Intrigued by the business, she took to waiting on tables the following summer and, on graduating from Herkimer High School, enrolled in Cornell University's hospitality management program. One of only five women among the one hundred students in her first year-class, she gave no thought to Cornell's male-dominated classes. In 1945 she graduated with honors and spent the next decade in New York City, first at Hilton's Plaza Hotel and then Horwath & Horwath, hotel accountants and consultants. A 1954 engagement took her to the Canadian Teachers' Federation, Ottawa, Ontario, Canada. From there she went to McCormick & Co. in Baltimore, MD, then to two Boston-based hotel firms. In 1963 she was appointed Treadway Innkeeper in Batavia, where she was awarded the key to the city for community relations. She moved on to manage other properties until tapped in 1979 by Genesee Community College in Batavia to develop its hospitality-management program. Thereafter Miss Wright taught at Rochester Institute of Technology and Tiffin (Ohio) University, where she retired in 1990 and began consulting. Later she returned to Batavia as staff resident at the then "Victorian Manor." In 2001 she moved to Cooperstown and assisted at the Fly Creek Cider Mill until fully retiring in 2009 due to vision challenges. For many years she was an active Cornell and Hotel School alumna, holding offices in successive areas, raising scholarship funds, and writing class-news columns. In 1989 Mary joined Rotary in Tiffin and maintained her active membership until being designated an associate member in Cooperstown. A Paul Harris Fellow, she was curator of the Cooperstown Club's collection of over 720 banners. From her perspective, Rotary's motto, "Service Above Self" made membership a perfect fit for someone who was service-minded from the very beginning, and whose career was the service industry. Raised in the Episcopal faith, Mary found much comfort in later years as a devoted and faithful member of the First Presbyterian Church of Cooperstown. Wright always took great satisfaction in her multifaceted journey. She once stated, "I accepted that it was a man's world, and I always thought of myself as a business person in that world. I'm proud to have been the first woman or the first person in several of my jobs, and proud of the unexpected honors that I was privileged to receive." Predeceased by her immediate family, she is survived by first-cousin families of Mikwanago, WI, and second cousins in central New York. She is further survived by her faith community at the First Presbyterian Church of Cooperstown, her fellow Rotarians, Cornell Alumni, those in the hospitality industry, and her former students and mentees. A Memorial Service to celebrate the life and legacy of Mary R. Wright will be offered at 11 a.m. Friday, December 8, 2017, at the First Presbyterian Church of Cooperstown, with the Rev. Elsie A. Rhodes, pastor, officiating. A reception will follow in the adjoining Chapel. In lieu of flowers, memorials may be sent to the First Presbyterian Church of Cooperstown, 25 Church Street, Cooperstown, NY 13326; or the Cooperstown Rotary Foundation, PO Box 1271, Cooperstown, NY 13326. Inquiries may be made of executor H. William Michaels of the Fly Creek Cider Mill, Fly Creek, NY 13337 (607-547-9692).